-Oh, The Places You’ll Go! My mother gave me this Dr. Seuss book the day I graduated from high school. Although it may seem like an odd book to give to an 18 year old, I think it is a great reminder that we always have a choice in life. We don’t need to follow the crowd. Instead, we can make our own decisions. At least that’s the message I got. Am I close, Mom? Many say the secret to happiness is not necessarily having what you desire, but instead wanting what you've got. There’s great wisdom in that, but it’s useful to also recognize that people’s lives are continually changing and so too are their living situations. So when people find themselves needing to relocate, they are confronted with many big decisions; and no matter what is chosen, the outcomes will have an impact on lifestyle and happiness. When making these big decisions, there are constant outside pressures, too. Realtors, media, developers, home lotteries, and show homes all highlight what they consider essential for a home, and the message is a relatively familiar picture of abundant luxury. There are even oh-so handy tools like the dream home checklist where you can select your wants and needs, number of rooms, number of pools, and so on. Whether we’re looking to buy or rent, the default storyline we’re told is that we should be constantly living in bigger, more luxurious homes. Alternative approaches are typically absent. Canadian homes are the least crowded of any country. The average Canadian home has 2.5 rooms per person. Is this essential? If people in every other country on the planet are living in smaller homes than us, it suggests that at the very least, we can give some thought to how much space we really “need” as opposed to “want”. Maybe the master suite with ten foot ceilings and an ensuite with multiple sinks shouldn’t be at the top of the list for everyone. These features are nice, there is no question. What’s also undeniable though, is the fact that choosing this approach drives the need for more space and increases the overall cost to build and own. Repeat the “more features is better” decision process ten times and things start to balloon, including your housecleaning schedule. Suddenly you’re spending every Saturday working to simply get your house clean and put back together. I don’t know about you, but I’d rather be visiting with friends or spending time with my family. Alternatively, our houses can be designed to serve us, instead of the other way around. We can also seek to incorporate ways of living that are proven to make us happy. This includes things like living in a location that fosters interaction, physical activity and good walkability to surrounding amenities and resources. It is these things that will improve your life in ways a dual sink bathroom never will. The question is, how can you bring this approach to life? Have you heard of infill development? Infill housing developments are homes built in established neighborhoods. In Saskatoon’s case, that relates to neighbourhoods like Broadway/Nutana, Riversdale, Caswell Hill, City Park and North Park. Infill development helps a city create attainable, innovative, and integrated housing and communities. In doing this, they contribute to a diverse, sustainable city, with a lower impact on the environment. I believe in the value of this approach for both people and city vitality. To put my money where my mouth is, I built a laneway house. My partner, Shannon, and I moved out of our house and into our newly built laneway house last fall. The move meant we went from 1050 square feet into 770. That might sound like a challenge – and it was – but overall the process and end result has been fantastic. Not only is this a successful demonstration project for my company, Laneway Suites, but it’s also a successful personal project in seeing how many of the typical “house norms” we could kick while still remaining satisfied. It is surprising what can be left behind. We moved in and quickly discovered that owning less stuff is easier than organizing the stuff we have.We are paring down and that feels really good. By reducing the physical clutter we actually feel mentally lighter. We no longer feel the need to fill our house with stuff and we don’t have vacant space to store anything unnecessary. With all that in mind, though, I realize that laneway housing isn’t for everyone, but it’s built on the principles of infill housing, and infill projects take a variety of forms. No matter what, when a house is built on an existing lot in an established city neighbourhood, the residents are automatically set up with plenty of perks, both in and outside of the home. For example, we were able to utilize the existing land, water lines, sewer lines, roads, sidewalks, trees, bus routes, corner store, and other amenities from the very beginning. These things matter, and they contribute to a vibrant, sustainable and inclusive neighbourhood whether you’re in a laneway house, townhouse, or detached home. 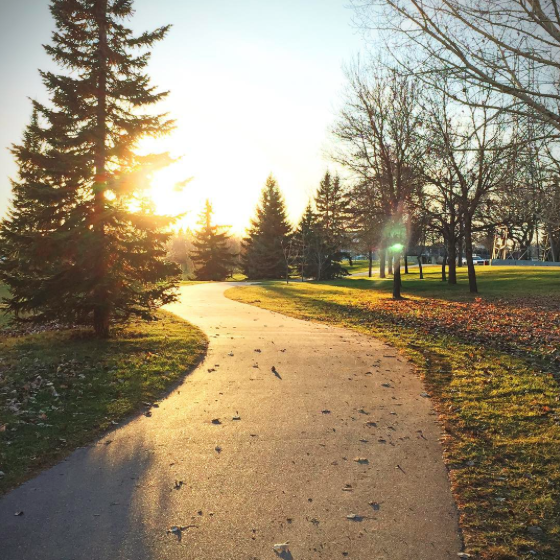 Saskatoon’s older, core neighbourhoods are established and rich in amenities and services. They are becoming seen as desirable areas to live, for many people. Urbanist Charles Montgomery points out that “it is a neighbourhood’s place in a city, and the distance its residents travel every day, that make the biggest difference to social landscapes.” To paraphrase, he’s saying that happy, healthy homes and communities are influenced by mobility, walkability and proximity. In the new home market these days, it’s rare to find thoughtful home and neighbourhood design that can produce healthy lifestyles and communities. It takes time for these things to materialize. Walkability, lifestyle, minimizing footprint, and building for the future are important factors to consider when building or buying any home. When I look at the projects Shift Development has produced, I see these ideas realized. This separates Shift Development from the pack. Shift’s projects consistently hold true to these values and always manage to achieve a strong mix of technical performance blended with healthy social aspects. You need only look to Mosaic or The Two Twenty to see this in action. What’s exciting is that Shift is on track to do it again, this time with Element Urban Village in Riversdale. Urban Villages are popping up all over the world. In fact, the lifestyle they can provide is so attractive, Saskatoon is even incorporating it into new communities. I’m certain that Element Urban Village will create a vibrant place to live for its future owners. I’m especially excited to see Saskatoon’s first solar powered electric car-share as a part of Element. If I hadn’t just built a laneway house, I’d be tempted to move there myself. Jeff lives with his partner Shannon, dog Henry, and turtle Mikey in their laneway house in North Park, Saskatoon. He is a guy with a keen interest in building for energy efficiency, longevity, and quality of life. Jeff is a consulting engineer licensed to practice in Saskatchewan and is also the owner of Laneway Suites, a design/build firm specializing in laneway housing in Saskatchewan. 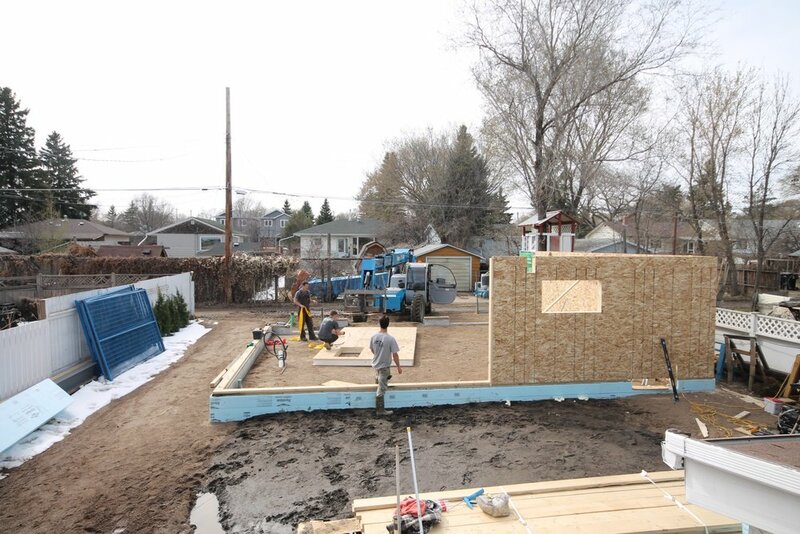 Laneway Suites has teamed up with BLDG Studio to build LANESHED: comfortably compact backyard “tiny sheds”.